Bounce FIT will take you to a new level of working out! High intensity yet low impact, this will get your heart pumping, your heart soaring and your muscles yee-haa-ing! We took our time launching fitness sessions because we were looong for the perfect instructor. Sessions are designed to cater for all levels of fitness – and if you need to take a break there’s nowhere more comfortable than a springy trampoline. Ria Binney, our resident Bounce FIT instructor, takes you through the basics in this blog post. Please wear sports clothing (you’ll get hot!) and bounce socks. 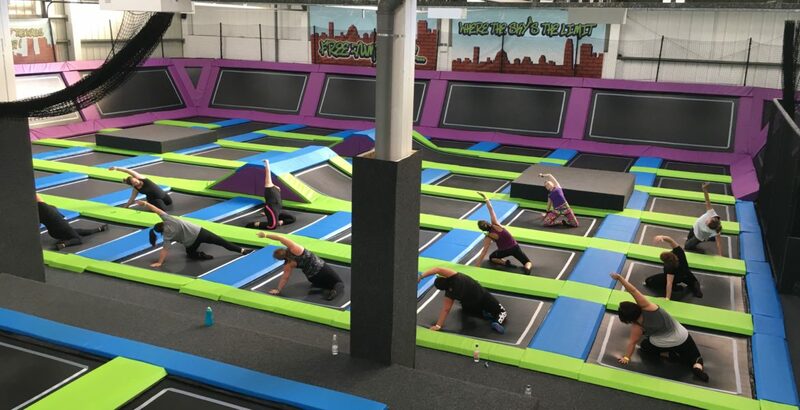 Each class is 45 minutes in duration (of course you can use the rest of the hour to have fun on the trampolines!). Please book online or phone 01273 580029 to book. Price is £7.50 per session. Sessions are designed to cater for all levels of fitness. Don’t just take our word for it – check out this footage by Active Sussex and This Girl Can! *Unfortunately there are no showers/leisure changing rooms at Sky High.